Since my family's AHmazing trip to France (seriously, watch the videos and cry a little with me over the lack of alps in Boston), I've been completely and totally re-obsessed with the French language. My brother and I were enrolled in an immersion school when we were younger, where you literally understand nothing for the first however-long...until the gibberish the teacher is speaking magically turns into comprehension. We learned math in French before we did so in language, literally and figuratively making it a foreign language to me! Okay, math jokes aside, learning a second language that young was an incredible gift! We stayed in the immersion program (which was in a public school btw) until middle school. After which, we'd have one or two classes in French before each of us transferred to private schools for high school. While absolutely awesome for my other classes, private school wasn't the best for my French language skills. For my AP class, we read "Le Petit Prince" in the original French... something we read in elementary school for my public education. I took the AP French test my sophomore year and haven't taken an organized class since. Before this gets brag-y OR complain-y, let's just get back to the present, shall we? I'm back to being SUPER obsessed with French! Luckily, my lovely Canadian college roommate will chat en Francais with me but sometimes I really need to just make some embarrassingly beginner mistakes while no-one's watching. The road to re-billingual-ing myself is apparently paved with cringe-worthy "I should have known that" moments. Who knew? 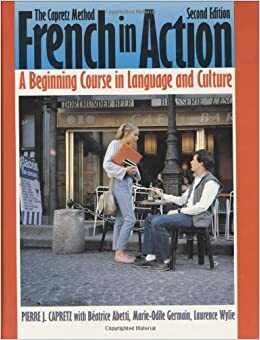 Since re-starting my French kick, I've looked for a loooot of online, app, and podcast resources. Most of them are definitely geared more towards beginners, using your standard "je m'appelle" = "I am called" translation teaching. Which, as we've established, definitely ain't the way I learned! So, if (like me!) you'd like to dive into the French language headfirst rather than getting fed the language word-by-word/piece-by-piece... you've come to the right place! This 52-video series apparently has a "cult following" as described by website FluentU. While it's definitely pretty repetitive (and outdated, ooof some of the outfit choices! ), it will also allow you to start with an immersive experience regardless of your previous language skills! It's great for brushing up on your existing French vocab and grammar, plus there's a pretty cute story line woven throughout the learning to help you remember better! Though I don't really like the translation-style of learning, duolingo somehow managed too charm me! I'd say about half of their app is translation based- during different mini-courses, they'll ask you to translate either from French to English or English to French, while providing a bunch of mixed up and extraneous words to build your phrase. They also have a speaking portion to these courses, where a phrase is said aloud in a French accent and you're asked to record yourself repeating it (don't worry, you can turn this off if you're in a public place!). Finally, they also have texting-based conversation bots to really test your small-talk abilities! I think what really sucked me into this one is that it keeps track of the number of days you've met your goal- I love competing with myself! I LOVE this goofy little language-learning tool! It involves aliens, a mostly-naked Victor Hugo, and the spreading of the French language and culture throughout the galaxy! This one has a little bit of everything- there are videos, audio components, verb conjugations, and a funny little story included in the free trial! I really like that they let you get though the whole lesson- the learning, the testing, and the cultural morsels- before grading your answers. They'll then email your responses to you with corrections and explanations about any mistakes you've made. You can also pick a "spicy" or "non-spicy" version, depending on your level of tolerance towards sometimes-racy French jokes. Netflix's French language section, which I'd be WAY more pumped about if they had French subtitles. They have them in English, Spanish, Chinese, and others but NO French? Like what? UPDATE 5/25: make sure to check with your local public library as well! Not only might they have physical resources of all kinds to help with language learning, but they might have sites/apps like hoopla and kanopy which contain awesome collections of french videos! I'm not sure about other cities, but Boston has many meetup groups and an amazing French Cultural Center (with a plethora of offerings in-person and online. I did a presentation on them for one of my librarian classes and I'm in love). Unfortunately for me, they always seem to have their rendez-vous when I'm at work- the downside of evening shifts!- but these would definitely be amazing options for building confidence and ability when it comes to listening comprehension and spoken conversation skills! Please let me know of any resource that you think belong on this list- I am pretty much always going to be looking for new ways to better my language skills. Even just these past weeks have upped my abilities. Practice makes perfect, after all! This past week especially, I haven't had classes to distract me from my language extracurricular so I'm remembering more and more of my years of schooling while increasingly feeling confident in my renewed bilingualism. Merci d'avoir lu ma poste! J'espère que cela vous aidera, même un petit peut, sur votre voyage en la langue française!